Olympian Jessica Ennis was cheered on by thousands of people as she took part in London's annual Lord Mayor's Show. The double gold medal winner travelled the three-and-a-half-mile route from Mansion House, via St Paul's, to the Royal Courts in a sports car. The parade marked the inauguration of the 685th Lord Mayor of the City of London, Alderman Roger Gifford, whose mode of transport was a golden coach. But he was forced to take a car when the 18th Century carriage broke down. 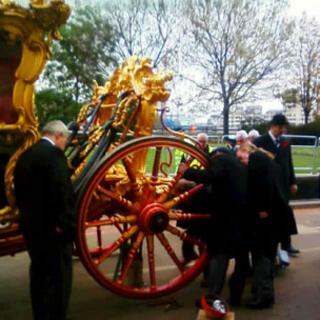 A spokesman for the City of London Corporation said: "The 250-year-old coach broke down on the return journey from the Royal Courts of Justice to Mansion House. "The new Lord Mayor who took office yesterday, and this was his first outing, was taken safely home to Mansion House where he now lives for the year by the Pageant Master Dominic Reid." Mr Gifford arrived ahead of the parade on the royal barge Gloriana. It was the £1m boat's third official outing this year following the Jubilee pageant and Olympic torch relay. Saturday's procession of 6,500 people included 18 vintage cars, a tank and a steamroller with countries from as far as Hong Kong and Mexico represented. But this year there was no fireworks finale. Ahead of the event organisers said: "After the wonderful Diamond Jubilee and Olympic celebrations this summer, it was felt that there are only so many fireworks we should be sending up in one year. "It has been agreed that the display will not take place this year." Mr Gifford is the first Lord Mayor with a background in banking since the crisis of 2007. The Lord Mayor's Show will celebrate its 800th anniversary in 2015.